October issue on sale today, in print and online! | What Hi-Fi? October issue on sale today, in print and online! Our October issue is packed with goodies, including brilliant wireless speakers, a 16-page Ultimate Guide to hi-fi speakers, 50in TVs for less than a grand and headphones to give your ears a treat. 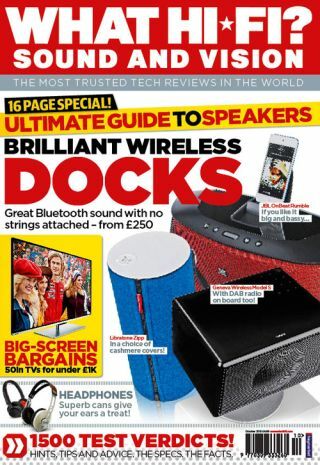 Our cover feature this month is Wireless speaker docks. We've put together eight Bluetooth and AirPlay speakers from £250 that will make streaming music from your smartphone, tablet, PC or laptop a breeze. Old favourites from B&W and Cambridge Audio go up against newcomers from Geneva, Panasonic and Sony. The winner may surprise you. Next up is a round-up of £140 to £180 on-ear/over-ear headphones. These make a perfect upgrade for your hi-fi or portable device, with last year's Award-winning Philips Fidelio taking on new rivals from Beyerdynamic, JVC, Onkyo, Sennheiser and Meze. If it's a new telly you're after, then did you know you can get a giant 50in+ TV for less than a grand? Oh yes. We've been sniffing out the best bargains, and discovered some cracking deals on big screens from LG, Panasonic, Samsung and Toshiba. If we tell you that the winner – a 51in plasma with smart functionality – costs just £700, you get the picture. Of course, we haven't forgotten true hi-fi lovers, and so we bring you the Ultimate Guide to hi-fi speakers from £165 to £18,000. There's something for everyone here, from entry-level budget standmounters to flagship floorstanders costing five-figure sums. And if you need a new stereo amp to go with your new speakers, this month's six-way Group Test provides the ideal upgrade as we look at models in the £1500-£1700 range. Last year's Award-winning Roksan Caspian M2 battles it out with Audio Analogue, Heed, Naim, Rega and Yamaha. Can the Roksan hang on to its crown? Elsewhere in the issue you'll find a smorgasbord of First Tests as we run our eyes and ears a bevy of new products in the run-up to our 2013 Awards in October. You'll find our verdict on the Marantz CD6005 (the replacement for the Award-winning CD6004), Sky's £10 Now TV set-top box, KEF's first pair of in-ear headphones, multichannel speaker packages from Cambridge Audio and Monitor Audio and a terrific new DAC from Arcam. All this and more is in the October issue of the magazine, on sale now.